Middle East air cargo traffic was strong in 2015, expanding 11.3 per cent, while in the global arena volumes grew at just 2.2 per cent, the International Air Transport Association (IATA) reported. 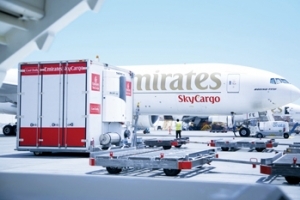 Middle Eastern carriers had a freight load factor (FLF) of 42.8 per cent for 2015. December traffic volumes grew 4 per cent over the same month in 2014. Centre Point Logistics (CPL) is set to open a large warehouse at the Logistics District in Dubai South later this year. Dubai-based DP World has awarded construction contracts for its $1.6 billion Terminal 4 at Jebel Ali Port. Contracts went to Dutco Balfour Beatty and BAM International for different facets of the project. Phase 1 of Terminal 4 will add 3.1 million teu by 2018, taking total capacity at Jebel Ali to 22.1 million teu. Qatar Navigation (Milaha) has delivered a net profit of QR1.095 billion ($300.6 million) for the full-year of 2015, a 4 per cent increase compared to the same period in 2014. Its operating profit increased 18 per cent to QR772 million, up from QR656 million in 2014, the company reported. Milaha’s earnings per share increased to QR9. Aramex profit down 2pc ARAMEX, the logistics and transportation solutions provider, reported its 2015 net profit decreased 2 per cent to Dh311 million ($84.67 million) while revenues reached Dh3.83 billion, up 5 per cent over 2014. Q4 net profit was Dh57.6 million, down 36 per cent compared with Q4 2014.